When does a path become a road? Is it volume of travelers, difficulty of terrain or perhaps the need to arrive more rapidly at the destination to create the attention and resources needed to smooth out the path? For zero energy (ZE) buildings the path is getting worn and some obstacles are being removed. It is easier to travel, but we’re still far from the destination of ZE buildings as standard practice. Yet along the way the cumulative efforts of hundreds of entities and individuals are making the journey a priority. NBI engages in many of the efforts to get all buildings to zero energy from policies to practices to performance outcomes. One such activity is our bi-annual publishing of the Getting to Zero Status Update and List of Zero Energy Projects in North America. The list is close to 500 projects or buildings verified as zero energy performance or emerging toward that goal. Those of us working to influence the built environment to low energy can see how the path is being smoothed and where to help accelerate ZE buildings. Here are four critical drivers to get us there. Practitioners. This tribe is growing. In our debut list in 2012 I could name most of the firms of the 60 buildings. Today’s list has approximately 70 mechanical-electrical-plumbing firms (MEP) and 100 architect firms involved in projects. 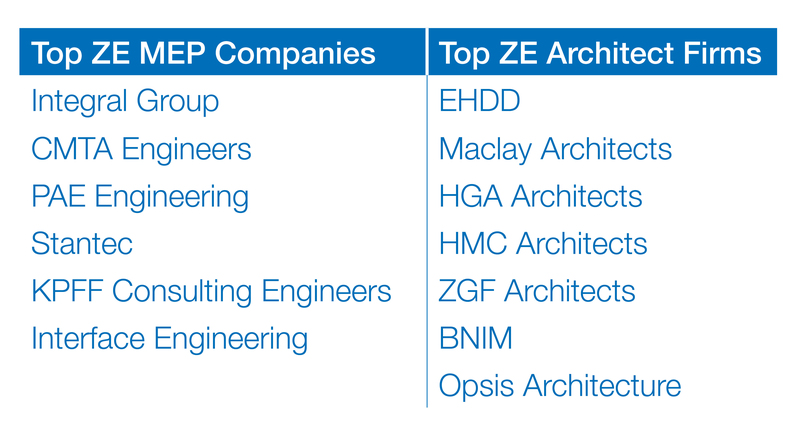 The firms shown in the table below have the most projects and a legacy of ZE design and consulting. They’ve grown their ZE practice and clients, in part, through the use of the list to both present their role in the industry and, more importantly, show the range of project types, locations and owners on the path to zero. In turn, they’ve also shared their knowledge, skills and experience to further the skills of colleagues. Projects. The list has grown 700% since 2012, doubling per year. ZE projects now exist in all but six states and are in four of the 10 Canadian provinces covering all North American climate zones. While most projects are in education, office, and multifamily – 72% of the total – the list has close to 20 different building types represented with sizes increasingly reflecting the market. For example, in the 2018 list more than 40% of all buildings and 88% of the total floor space of ZE emerging buildings are 50,000 square feet or larger. These buildings rock perceptions on efficiency potential with energy use intensities (EUIs) averaging near 20 kBtu/sf/yr. That is half one of the best new construction codes in the country (Title 24 in California) and approximately a 75% reduction in energy use compared to an existing commercial building in the U.S. (CBECS 2012). Low score wins! Private Sector. A valuable tool for getting market players on a smoother path is to show that their constituents are already there – be they customers or competitors. No one likes to lag while others are making progress. Private, for-profit companies now make up 26% of the list with private and nonprofit owners representing 46% of all projects. This data, combined with significant increases and attention to Corporate Sustainability Reporting (CSR) and Indicators (CSI) can help make the case for getting on the path and paving the road to better business outcomes. Policies. Rarely are codes and policies ahead of those taking early steps down a bumpy path, but ZE codes and policies are growing. Either statewide, by county, or by municipality, new ZE codes and policies are sending distinct market signals necessary to drive goal setting and investment around ZE projects. California, Oregon, New York, Arizona, Massachusetts, and British Columbia are just some places where ZE is explicit in state policies, while many cities are taking on energy and climate change actions through local plans and networks. Additional industry attention on zero-carbon and electrification are further pushing the ZE potential. No matter where you are on the path you’ve got a role to play in making the journey smoother for others. Use our Getting to Zero List and Zero Energy Resource Hub and we hope you join us in April at the National Getting to Zero Forum. Let’s build the road together.